All lamps are fitted with UL listed and approved components. They are available with standard push-thru type switch or 3-way switch. Cord colors are Gold, Brown, or White - 8' or 15-foot. Felt is applied to bottom of all lamps. These majestic pieces of artwork will make a beautiful, bold statement in your home. Mahogany, Cherry, Walnut, Maple, Oak, or a combination of hardwoods can be used. 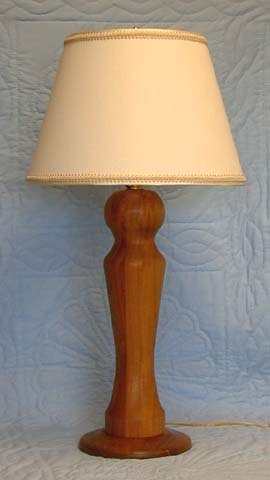 Lamps on this page are furnished with shade shown, but you may choose any feature, shade, or color you desire. Customer pays shipping; WA residents add 7.7% sales tax. Mahogany 'Webol' 5/4" laminated, 19"; 30" tall from base to top of shade. 8" base plate, 4-1/2" across widest part of body. Shown with Fine Muslin Shade 10" x 16" x 11"trimmed with Grosgrain Ribbon and French Braid. Cord is 8' Gold color. Push-Thru Switch. Oak 'Milk Bottle' 1" laminated, 11". 23" to top of shade. 5-1/2" across widest part of body. Red Shade is 8" top x 14" bottom, 8" long, trimmed with Grosgrain Ribbon and matching French Braid. Brown 8' Cord; Push-Thru Switch. Sometimes a new shade is all it takes to make an old lamp useful again. 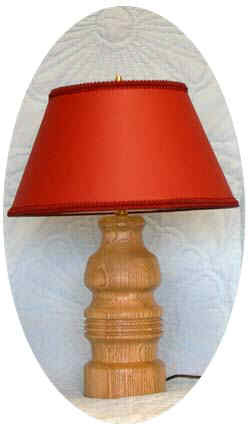 We can re-cover your old lampshade frame or make a shade using a new frame, a different shape perhaps. Many frames, materials and fabrics available. 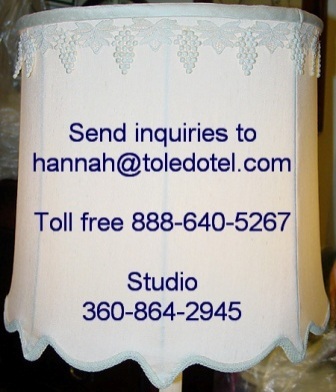 If you're a Quilter, and have fabrics left over from a quilt you've made, we can use your fabric to make a matching lampshade for your bedroom lamp. We use matching color Grosgrain Ribbon on top and bottom wires - not paper tape like you see in discount stores. If item description and prices are not shown, click on e-mail link to request more information.